Stop waiting for checks in the mail! Get funds in your account within hours not weeks. Accept all major credit cards. With one easy click your customers can pay their invoices online with any major credit card for minimal costs. A complete payment processing solution with no long term commitment. Just pay a low monthly fee to access all of the features you need to get paid quickly and efficiently. Processing high volumes of transactions? Invoices Unlimited offers volume pricing that rewards you for the level of business you process with us. Contact us for a custom quote! Already Have a Merchant Account? We offer you the option to use your current merchant account. With a simple setup process, you can configure Invoices Unlimited with any current merchant account. We offer the convenience and affordability of a low monthly fee with no longer term commitments. We offer high volume processing incentives! Contact us now to get a custom quote with price breaks at higher transaction volumes. There is no reason to delay! 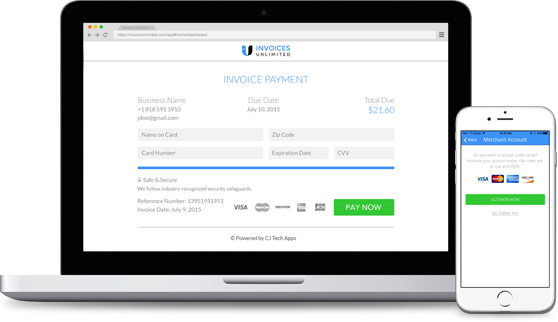 Sign up now and get immediate access to the Invoices Unlimited payment processing features. Simple and safe processing for your customers. You get paid faster while providing more convenience and security for your customers. Leverage our support resources. Invoices Unlimited provides support & assistance to meet your payment processing service needs.